Not far from the town of Seward, there are nearly 40 glaciers making up an icefield that spans more than 300 square miles, all contained within Kenai Fjords National Park. The largest of these is Bear Glacier. It's not far from Seward to Exit Glacier, the most easily accessible glacier in the park, but it's also possible to reach Bear Glacier from Seward – if you head out on the water. You can go on cruises that visit the many fjords in the park, and you can even go sea kayaking through the fjords. 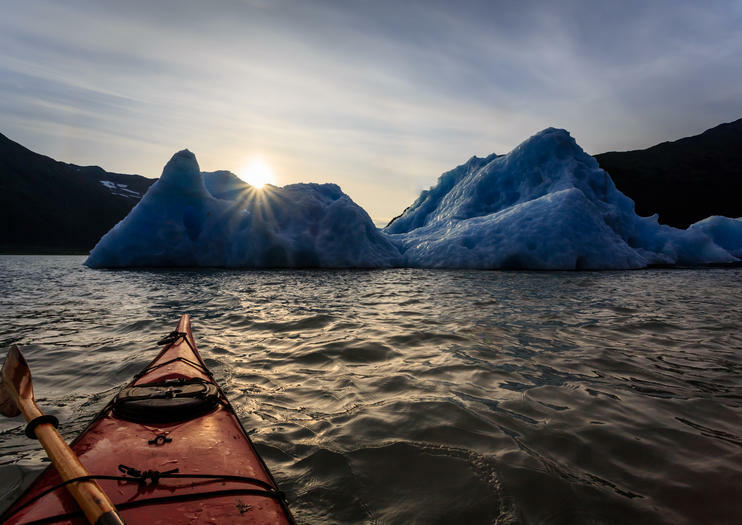 Sea kayaking up to Bear Glacier gives you a chance to see the glacier and its iceberg-filled lagoon up close. You can also choose an overnight adventure, camping near the glacier. Even if you opt for a day cruise, you'll be treated to incomparable glacier views, plus the chance to see puffins, whales, and sea otters. Kenai Fjords National Park is open year-round, but as you might expect it's much more difficult to reach and explore during the winter. Water tours of Bear Glacier are generally available about the same dates that the park's visitor centers are open – from Memorial Day in late May through Labor Day in early September. If you're visiting during the winter, you can still see Exit Glacier on cross-country skis, snowmobiles, or even dog sleds. Explore the pristine waters of Resurrection Bay on this 5-hour Kenai Fjords cruise. Travel 55 miles (round-trip) along a rugged coastline and admire alpine glaciers nestled high in the mountains. Snap plenty of memorable photos as you sail past Bear Glacier and stop close to sea lion colonies and seabird rookeries. Along the way, keep watch for whales, sea otters, Dall’s porpoises, eagles and mountain goats. Enhance your maritime journey with an upgrade to enjoy an Alaska salmon and prime rib buffet, served onboard while you cruise. Treat yourself to an abundance of wildlife viewing with this 3.5-hour Kenai Fjords cruise in Resurrection Bay from Seward Harbor. Travel 55 miles (round-trip) along a rugged coastline and snap plenty of memorable photos as you sail past Bear Glacier. Sail close to sea lion colonies and seabird rookeries, and keep your eyes peeled for whales, sea otters, Dall’s porpoises, eagles and mountain goats. Journey to the remote, glacier-carved Northwestern Fjord in the Kenai Fjords National Park on this full-day small-vessel cruise from Seward. Pass through Resurrection Bay, the Alaska Maritime National Wildlife Refuge, Cape Resurrection, Granite Pass, and Harris Bay. Whether you’re a birder or whale-watching enthusiast, you’ll likely to snap plenty of photos of humpbacks, orcas, Steller sea lions, seabirds and more. Watch for glacial calving, where giant chunks of glacial ice break off and crash into the water. Light breakfast and lunch are included on board. Discover the glaciers and wildlife of Kenai Fjords National Park on this 7.5-hour catamaran cruise. Enjoy 130 miles (round-trip) of jaw-dropping scenery as a National Park Ranger provides engaging commentary. In Aialik Bay, watch for the calving of tidewater glaciers, when chunks of ice break off and crash into the water. From the comfort of a heated cabin, spot Steller sea lions, orcas, humpbacks and puffins that call these waters home. Upgrade and enjoy a buffet-feast of Alaska salmon and prime rib. Kayak around large chunks of ice floes in a calm lagoon on this 5-hour Bear Glacier adventure from Seward. A jet boat first speeds you near Bear Glacier, the largest glacier in Kenai Fjords National Park, where you’ll board a kayak. Admire the stunning winter wonderland as you paddle through the icy labyrinth. Spot wildlife such as sea otters and seals, and enjoy snacks along the way. This small-group tour is limited to just six people, ensuring you’ll receive personalized attention. Admire the icy blue waters of Resurrection Bay as your boat glides past glaciers, snowcapped mountains and dramatic cliffs. On this 5-hour cruise into the Kenai Fjords across Resurrection Bay, keep watch for whales, puffins and otters with the help of a wildlife guide. Step onto the shores of beautiful Fox Island, and sink into a mouthwatering buffet of wild Alaskan salmon and prime rib at a private lodge. This Resurrection Bay cruise gives you the chance to learn about the area’s natural history and skip stones at a pebble beach. Sail the waters of Resurrection Bay in search of Californian gray whales on a 4-hour cruise from Seward. These huge mammals arrive here every March through May on their annual migration northward into Alaska’s waters. Watch for these incredible beasts and other whale species, as well as other wildlife, and view the luminous blue glaciers crowning the surrounding mountains. On board commentary, binoculars, and hot drinks included. Search the waters of Resurrection Bay and Kenai Fjords National Park for gray whales on this 4-hour cruise from Seward. In the spring, gray whales migrate more than 5,000 miles from Baja California to Alaska’s Bering Sea in search of food. Learn about the whales from your crew, who are also wildlife experts. Keep your camera out for other wildlife sightings, including rookeries, seals and sea lions, and Dall’s porpoises. Bonus: A light lunch with a freshly baked cookie is included. Join a small-group tour for a 3.5-hour cruise around the pristine waters of Resurrection Bay from Seward. Travel for 55 miles (88km) round-trip into the wildlife-rich waters for up-close encounters with Alaska's massive bird rookeries and sea lion colonies, passing whales, and otters. Choose from two departure times from Seward for this small-group tour. Make the most of your shore time and explore the beautiful Kenai Fjords National Park on this full-day tour. Hop aboard the catamaran and sail around the national park keeping an eye out for orcas, humpback whales, sea otters, sea lions, and more. Listen to informative commentary onboard as you observe these massive glacial formations and watch for calving. Enjoy aerial views of Alaska's natural beauty on a 1-hour scenic helicopter flight from Seward. Fly over the massive Bear Glacier in Resurrection Bay, and cross the mountains to Aialik Bay. You might see bears, whales, calving ice sheets, giant icebergs, and more as you explore the area around Kenai Fjords National Park and Chugach National Forest by air. Discover Kenai Fjords National Park, Resurrection Bay, and Aialik Bay on a 6-hour small-group cruise from Seward. Hear live commentary from the informative National Park Ranger guide as you look for Alaskan wildlife such as whales, sea lions, sea otters, and puffins, and stop at Holgate Glacier to float among the icebergs. Upgrade your cruise with an onboard buffet that features Alaska salmon and prime rib. A one-of-a-kind Alaskan experience that should not be missed, this 35-minute helicopter flight from Seward takes you to Bear and Aialik glaciers. Nestled among snow-covered peaks, Bear Glacier rests above a remote lagoon studded with massive icebergs the size of houses. See the walls of Aialik Glacier dropping into the ocean. Take photos of cascading waterfalls, old-growth forests and turquoise-blue water that surround a frozen landscape carved by millennia of advancing and retreating ice. Enjoy aerial views of Kenai Fjords National Park. Fly from Seward to Bear Glacier, soaring over Resurrection Bay with spectacular views of snow-capped mountains and massive icebergs. From waterfalls to old-growth forest, the scale of the Alaskan landscape is best seen from the air, and traveling by helicopter means you'll get an eagle's-eye perspective on the coast. When you reach Bear Glacier, you'll be looking straight down at Kenai Fjords National Park's largest glacier, and one of the world's biggest glacial moraines. Discover one of Alaska’s most beautiful creatures, the gray whale, during this 4-hour whale watching cruise. Head to Resurrection Bay with your group and watch the annual migration of gray whales from Baja California to the Bering Sea, generally from late February to May. Keep an eye out for other animals such as orcas, sea lions, humpback whales, bald eagles, and porpoises as you take in the beautiful Alaskan landscape. The area near Resurrection Coast and Bear Glacier Lagoon is home to impressive natural features—icebergs, ice fields, and tidewater glaciers. On this tour, see it from above while flying on a helicopter where everyone gets a window seat. Get a chance to see natural landmarks and wildlife including seals, orcas, bears, and moose. Kenai Fjords National Park, just outside of Seward, is home to some of southern Alaska’s most beautiful ice fields, fjords, and glaciers. With this scenic helicopter tour, save a ton of time by seeing much of the park from above in just 30 minutes. Fly over glacier-carved valleys, waterfalls, glaciers, icebergs, and rivers.